When I came to Australia I found it a bit strange to see avocado in salads, toast, and as a part of a savoury dish. Of course I had tried guacamole before in Mexican restaurants but for me that was the only savoury dish made with avocado. In Brazil, we mainly use avocado to make desserts, smoothies or eat it fresh sprinkled with sugar. 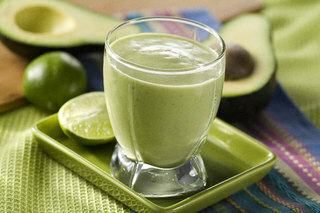 The Avocado smoothie recipe below is so creamy and delicious – quite filling too. We also use avocados for face masks and hair treatment. 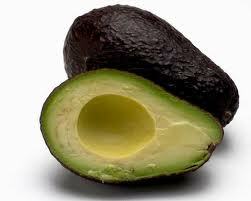 There are many types of avocados, in Brazil they are bigger than in Australia and the skin is green and shinny. Avocado is a wonderful fruit, rich in vitamins A and E, helps lower cholesterol, powerful antioxidants and good for hair and skin. There is an avocado tree in my Grandma’s house and I remember when I was a kid we use to drink a lot of avocado smoothies. My favourite thing was to put the smoothie a little bit in the freezer and the texture was almost like an ice-cream. My dad loves avocado with sugar for breakfast! Have fun with avocado and try the smoothie recipe below! Cut the avocado into two halves, remove the stone and scoop out the flesh. If you think is too thick, you can add a little bit more milk/water. Cut the avocado into two halves, remove the stone and scoop out the flesh in a bowl. Mash the avocado with a fork or use a potato masher. I personally don’t like to blend it as I like the texture when is just mashed. Add the lime juice, tomatoes, chillies, onion and coriander. Stir all together gently. When I can not find jalapeños chillies I use the bird-eye chilli. Serve with corn chips, on toast or as salad. TO KEEP THE COLOUR OF THE AVOCADO AND STOP IT FROM GETTING BLACK PUT SOME LEMON JUICE ON TOP. IF YOU HAVE LEFTOVERS, KEEP THE STONE ON AND WRAP IN FOIL BEFORE PUTTING IN THE FRIDGE. IF YOU MAKE A GUACAMOLE, KEEP A STONE INSIDE THE BOWL UNTIL THE TIME TO SERVE TO PREVENT THE CHANGE IN COLOUR (My husband didn’t believe me at first but it really does work!). This entry was posted in Recipes, Tips and tagged Avocado, Avocado smoothie, Guacamole by clarissaskitchen. Bookmark the permalink. That smoothie sounds so simple and delicious! I’m going to try it. I’d like to go for the guacamole, but here in Taiwan, it’s a little difficult to find avocado! no problem …. just waiting for the next brazilian seafood dish! xxs!